What is important for an speedsail or just for going fast? Those 3 things are giving the sail a feeling. There are several feelings, an sail with backhand, an very soft sail, a hard to start sail, an heavy on the hands sail, etc. These sails are the best 'balanced' sails on the market. However the last 25% of the balanced part has to be tuned by yourself. The Gaastra Vapor is the easiest one to get balanced, the NP RS Racing is a it harder to get balanced. But the reward with NP is a bit better when everything is in place. In general most fullrace sails got the most profile, some brands give their racesails an very low center of effort. Most speedsurfers are faster with a bit higher center of effort. But don't forget to downhaul your sails enough. 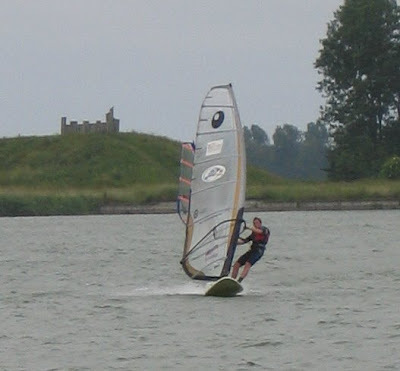 For the Gaastra Vapor '07 I would say in overpowered conditions +1cm. Most speedsurfers will benefit from these sails. These sails are very easy to get balanced, combined with an higher center of effort... When I heard of these sails I thought... poor marketing. But at my homespot, an local speedsurfer was instantly 5 km/h faster. I studied the sail, and it is very good. Both the North as Neilpryde are really good, and easy to rig. Why don't the pro's use this sails, these sails have less profile, less speed on tight courses. So when you are going for the last 1-2 km/h or knots... an full-race sail will have advantage. The center of effort is about the same as 'The fast sails for everyone', these sails are no widesleefs, and they definatly got less profile overall.